Sponsored by the College of Charleston’s School of Languages, Cultures and World Affairs, the 65th Annual Mountain Interstate Foreign Language Conference (MIFLC) was held in Charleston on October 15-17, 2015. Hispanic Studies Faculty collaborated in multiple capacities for this event to include organization and presentation. Dr. Mark Del Mastro served as the 2015 MIFLC President and chaired the Organizing Committee that included Dr. Lola Colomina-Garrigós (Program Director), Professor Devon Hanahan (Internship Director), and Ms. Laura Moses, among other faculty members across the school. Presenting their research were Professors Nadia Avendaño, Emily Beck, Mary Ann Blitt, Edward Chauca, Susan Divine, Elizabeth Martínez-Gibson, Antonio Pérez-Núñez, Marianne Verlinden, Joseph Weyers, Carl Wise, and Allison Zaubi. Chairing academic sessions were Drs. Hilary Barnes, Lola Colomina-Garrigós, Daniel Delgado, Susan Divine, Carmen Grace, Elizabeth Martínez-Gibson, Sarah Owens, Silvia Rodríguez Sabater, Joseph Weyers and Carl Wise. Conference sessions were held at the Charleston Marriott Hotel on Lockwood Boulevard, and the Thursday night reception and Friday night banquet were both held on the College of Charleston campus. 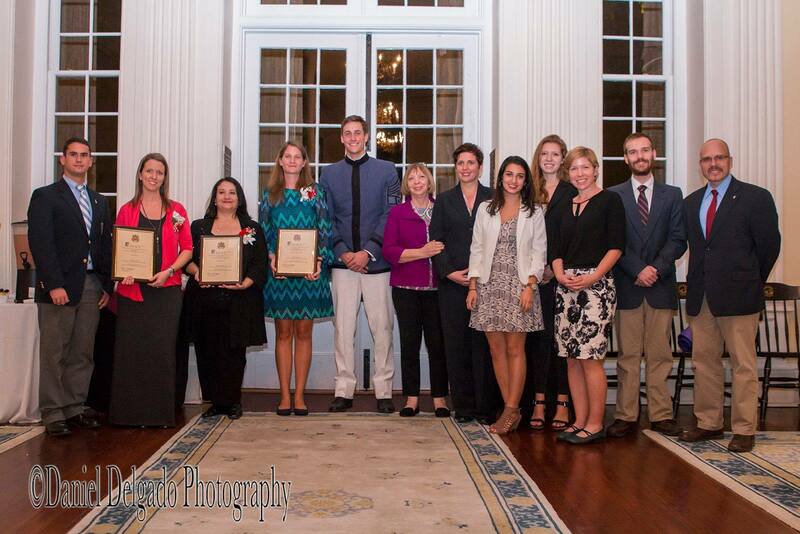 The awards ceremony took place on Thursday, November 12 at 7:00pm at the College of Charleston. 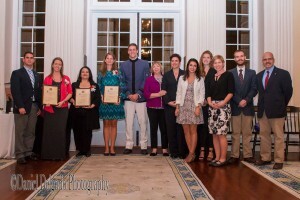 All three finalists received award plaques courtesy of the College of Charleston’s and The Citadel’s chapters of Sigma Delta Pi, and each finalist and their guests (one guest per finalist) enjoyed complimentary lodging the evening of November 12, 2015 and breakfast on November 13 courtesy of the Francis Marion Hotel in downtown Charleston. The 2015 S.C. Spanish Teacher of the Year also received a $500 cash award courtesy of D. Virgil Alfaro, III, M.D. ’84. All questions regarding the contest should be forwarded to Dr. Mark P. Del Mastro, Founding Director of Sigma Delta Pi’s South Carolina Spanish Teacher of the Year Award, College of Charleston: delmastromp@cofc.edu. Details for the 2016 contest will be available in March. On Monday, November 16, 2015 at 5:00pm in the Alumni Center of the School of Education, the following students were initiated into the College of Charleston’s Nu Zeta Chapter of Sigma Delta Pi, the National Collegiate Hispanic Honor Society: Tori Akerley, Anna Lee Ashmore, Keane Costello, Mariel Dronson, Christianna Ducharme, Savannah Fuller, Edwin Randolph Hille, Clare Hogan, Samantha Huddleston, Audrey Kaiser, Hope Mulry, Anne Nicoletti, Megan Norton, Olivia Roberson, Fabiana Simone, Rachel Taylor, Rodney Donovan Taylor and Lan Tran. Also initiated as honorary members were the following faculty: Drs. Edward Chauca and Antonio Pérez-Núñez. A reception followed the ceremony. This weekend, Dr. Irina Erman, program director and assistant professor of Russian Studies at CofC, is presenting her research in Philadelphia at the annual conference of the Association for Slavic, East European and Eurasian Studies. For his latest novel Tennessee River, Professor Raúl Carrillo Arciniega has been granted the Premio Literario Estatal de Novela (State Literary Award for Novel) by the the Coordinación de Fomento Editorial del Instituto Sudcaliforniano de Cultura in Mexico. Click here for additional details on all statewide and regional awardees of Baja California.